Fine Art Lavender Fields Wedding Shoot. This styled shoot in a field of lavender evokes qualities of a classic romance novel – where bygone fashion and the quiet curiosity of a young couple are at the center of the story. There’s a gentility and soft energy that speaks to those with simple tastes and unmasks the beauty in even the most modest of experiences. 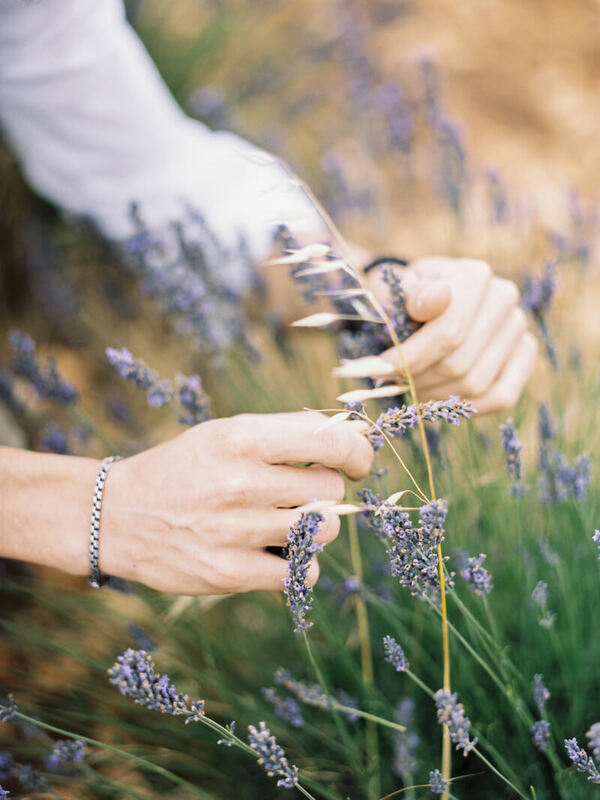 We all know lavender is incredibly fragrant; however, this shoot capitalizes on one of its charms – its color. The bride appears with a unique mix of both provincial and unconventional style, appearing picturesque as she stands in between the rows of lavender. Her ruffled long white dress is a beacon in the field of purple. Her accessories, although few, are appropriately suited for her look, with tall brown boots and a wide-brimmed hat fashioned with a charming black bow. The groom is rugged and it’s his brazen expression that makes his style come to life. 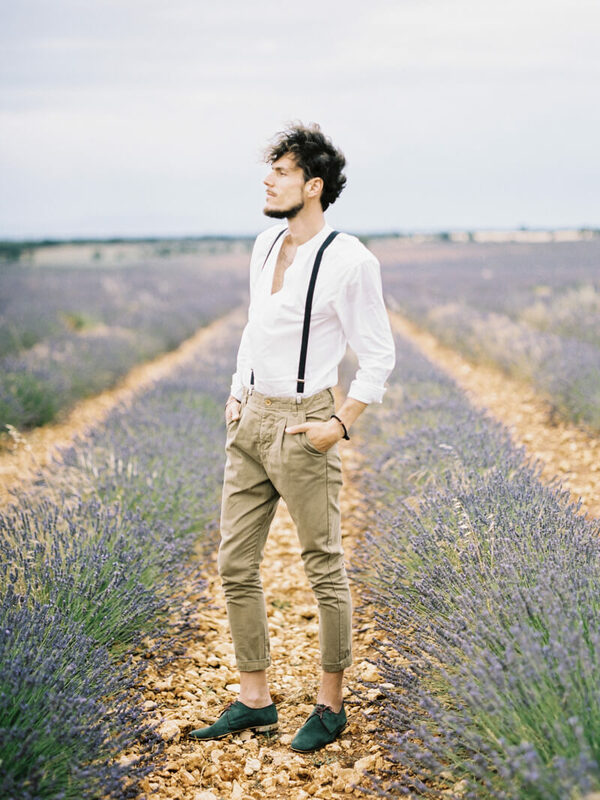 He dons khaki-colored pants rolled at the ankles, black suspenders and a white shirt. There’s so much artistic expression in just a simple smolder as the groom looks off into the distance. As they stroll through the field, splitting a row of lavender, there’s a charming balance between the two. When he is firm and brooding, she is light and charming. Together, they make a gorgeous pair. As he lifts her up into his arms, their styles and expressions are completely in-sync. The breeze is an added element in the shoot, causing the lavender, as well as her curls and hat, to tenderly catch the air. There’s a genuine romance created in the simple surroundings of the lavender field that only a small blanket and basket are needed to complete the presentation. And whether it’s a ceremony spot for the two to hold hands and promise forever, or simply a wonderful place to solidify their connection, there’s plenty to pique their senses. The simple, almost antique quality of this shoot is unique and novel. In a time where over-the-top luxury is high on the wish lists of many, the simple, pastoral nature of a lavender-inspired concept is breathtaking and refreshing. You can do worse than standing in a field of lavender with someone that you love, especially if it’s on your wedding day.